USD head coach Lamont Smith. Courtesy of WCC Sports. 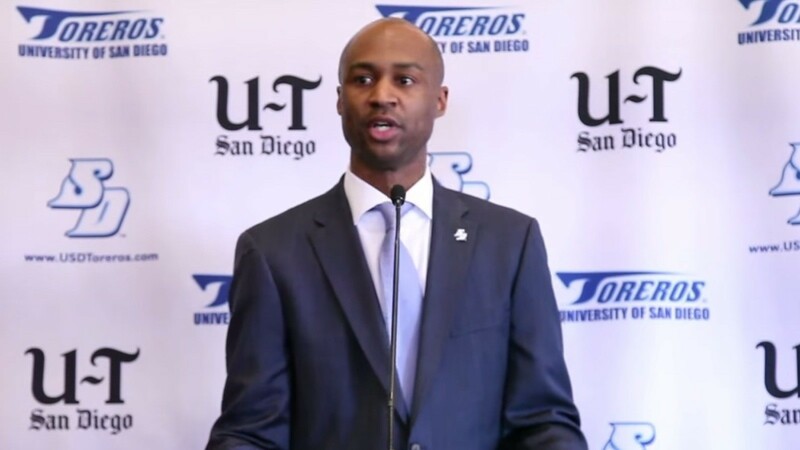 Nearly two weeks after he was arrested in San Francisco for suspected domestic violence, USD men’s basketball coach Lamont Smith has resigned, the university announced late Wednesday night. Smith, 42, was arrested on Feb. 25 at the Oakland Airport the day after the Toreros won their last regular-season game against the San Francisco Dons. A woman had called police shortly after midnight Feb. 25 claiming Smith had assaulted her at a hotel near Union Square. Smith was not at the hotel when police arrived. The victim said she and Smith were intimately involved, according to police. The San Francisco District Attorney’s Office declined to press charges against Smith on Tuesday as “a result of the evidence obtained from the investigation,” D.A.’s spokesman Alex Bastian said. USD said athletic director Bill McGillis “will begin and lead an immediate national search for our next head coach.” Assistant coach Sam Scholl was made interim head coach for the postseason following Smith’s suspension. The Toreros lost to BYU on Saturday in the West Coast Conference Basketball Championships, ending their post-season run. “This situation has been difficult for all concerned, and our prayers continue to remain with everyone,” USD said in the release. Smith is married with two children according to his biography on USD’s website. He took over the basketball program three years ago and this season was the first winning season for the Toreros under his leadership. USD’s 18 wins this season is the program’s most since the 2013-2014 season and this was the first time USD fished .500 or better in conference play since the 2007-08 season. Smith played for USD from 1994-1999 and was named the Toreros’ Defensive Player of the Year in 1997 and 1999 and served as the team captain from 1997-99.